In the match France-Iceland French coach Deschamps has shown since the early minutes of the quarter-final of Euro 2016 with Iceland to have cured the details so much to put their own offensive in the conditions to give their best terminals using the flaws of being not take opposing. Icelanders have tried to attack the French from the first third of the field by raising their center of gravity and carrying the defensive line near the downtown area. Deschamps ' men have exploited in their favor this tactical attitude opponent in no possession by signing two of the five networks with their attackers ' movements ' efforts to gain the space behind the defensive line. 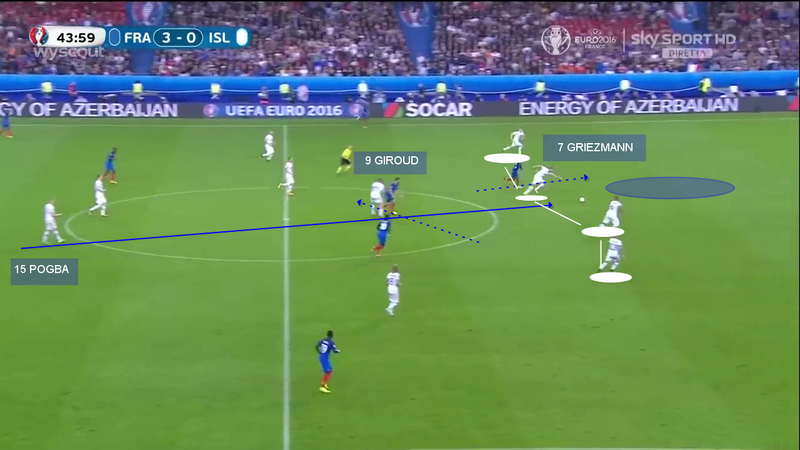 Development of Central game # 1 (Giroud Network at 12 ') – consolidation of French possession in the middle zone using the movement to support the low side part Evra and attacking forwards behind Griezmann and Payet between the opposing lines allowing Matuidi to gain time and space for a finish by passer-by in favour of Icelandic line come behind the counter movement Giroud short-long after. Development of Central game # 2 (Griezmann to 45 p.t.) – start of movement from French defenders with Umtiti serving Pogba in median. These, earned the second third of the field, serves vertically Griezmann who pretend catching the ball in favor of Giroud behind him. 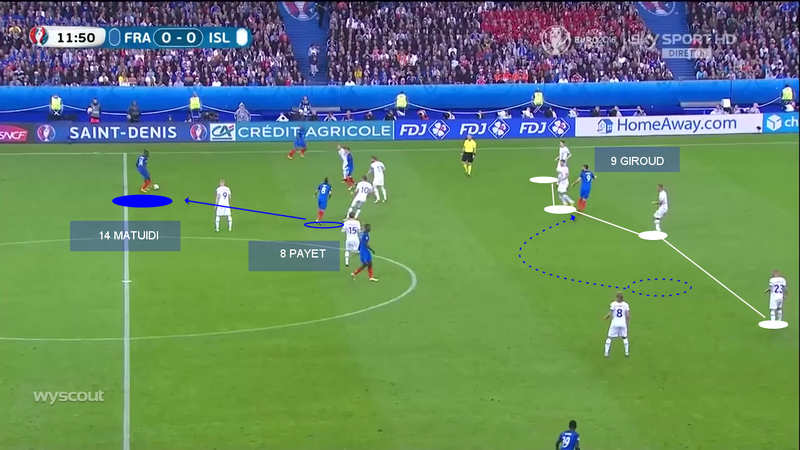 The short-long movement of French playmaker allows him to fit behind the Icelandic line and directly receive passing Pogba let pass by Giroud (movement from needles) that does not intervene to change its trajectory.